So you think you have supply chain challenges? How about daily price volatility and losses in transportation of up to 20%? Discussions with FoodLink Online, InfinityQS, AFS and Intelleflex. In spite of challenges—from production to supply chain—food is the best deal around in developed nations. 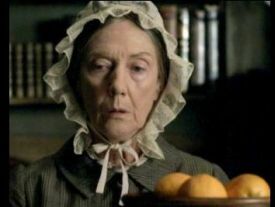 Masterpiece Theater, Cranford1 watchers will remember the guilty pleasure of eating that one luxury orange. Imported and expensive, or available only in summer, produce was of limited variety. But that was the past. With global supply chains, we have food in abundance, but not without cost. Variable supply due to bad weather, spoilage in transit, waste, and disease can plague the industry. Most consumers are unaware of these issues and look forward to that nice nutritious fork of food, brought to us by a complex chain from growers to chefs, all experimenting with their growing methods and recipes. As the summer rolls in and we expect a season of variety and availability of produce, it’s a good time to take a look at some of these issues. In the last month we have met with many companies—growers, distributors, carriers, grocers, and technology companies to discuss both the challenges and the solutions to improve the food supply chain. Many challenges plague the produce industry. They truly span from farm-to-fork, but let’s zero in on some supply chain challenges. 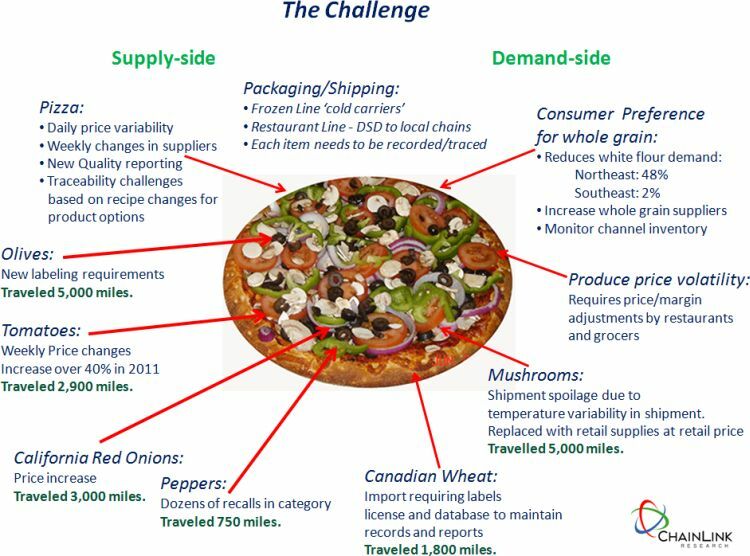 Prepared restaurant food, such as the pizza illustrated in Figure 1, is the perfect example of the variety of issues the produce industry faces: sourcing, packaging, pricing, transportation, and traceability. Recent legislation has increased the requirements for licensing imports, as well as labeling and information management and reporting along the chain. Seasonal produce supplies, creating a dependable distribution network, managing price fluctuations and consumer choice, and keeping food fresh and affordable all challenge the industry every day. Huge quantities of food are thrown out across the country at each stage of the chain, adding to the cost and reducing the availability of fresh food. I moderated a panel discussion with Kenny Lund, VP of Operations at the Allen Lund Company; Rob O’Rourke, President of RJO Produce Marketing; Anthony Sattler, VP of Produce at C&S Wholesale Grocers; and Eric Peters, CEO of FoodLink Online. These seasoned players know food! And what I learned about strawberries over an organic dinner before the panel was insightful. Imagine spending your year crafting, cultivating and hoping to harvest your product. After all that work, ‘pick, pack, and ship’ is a very short window. And you really don’t know until that moment how much product is available for sale to the customer. Nor do you really know the price! Nor can you guarantee, after all this work and investment, that this perishable product will be lovingly handled all the way to the end customer—pristine, sweet and with a decent shelf life so that the last berry in the home refrigerator is as nice as the first! On the retailer side, millions of Americans shop at small to mid-sized grocers. We can’t expect our local grocers to go out and meet with every farmer they buy from. So mid-sized grocers rely on the wholesalers to select the best produce. Even the largest retailers rely on these players to get them the global volume, variety, and price their shoppers expect at the super stores. 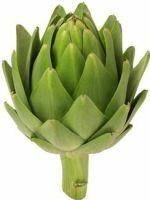 And high margin products—strawberries, as well as avocados, artichokes and asparagus—have to justify their price with the best taste. Who are the growers who are really producing these products? Discerning customers want to know, and they look for these products season after season. Retailers are not interested in returns. Returnes cost them money and customer loyalty. In fresh produce, unlike packaged or canned goods, once the retailers take possession of the product, they own it. They either make money or suffer big losses if their own process is not managed well. What about manufacturing? Manufacturing also has to address these same issues. Whose strawberries went into the jelly? Are they really organic? Which batch came from which source? And when we ship that product, can we trace from that source to the retail shelf? And of course the one constant across the whole chain—from farm to fork—is transportation. The problem is that the food transportation network is composed of hundreds of small to mid-sized carriers. Who is keeping track of the whole process? Who is monitoring quality and issues like temperature and exposure to germs and other predators? The food supply chain is a complex space. With thousands of players, from the family farm to the road-side sandwich shop, not everyone is going to implement the latest and greatest technologies. So collaboration is the key in making it all work together. Meeting many solutions providers and their customers, such as AFS Technologies, FoodLink, Intelleflex, and InfinityQS, we saw that these tech companies all have important contributions to make in addressing the challenges in the food supply chain. Some of the solutions discussed here can help the small players, while having the richness and scale to solve the most complex problems for the largest companies. Suppliers need to sell, and their market opportunity is perishable. Connecting with buyers quickly is critical. FoodLInk supports the grower from the bid and purchase order through the shipping and payment processes. And with their new FreshBuys, a marketplace for promotions, grocers can get their products on the network and get them sold to buyers quickly, saving time and money for both parties. The network capability brings together thousands of players from growers, to brokers, logistics carriers, and grocers, so that the whole process is managed. Buyers can place their requirements on the network and get multiple bids. This streamlines their procurement process and also allows them to see new producers and products. In a market where speed is everything (the clock is ticking on perishable product), the buying and selling speed is critical. FoodLink manages thousands of transactions per day, replacing the one-to-one model of enterprise software systems. They take technology from just an ‘administration tool’ to a real channel for business. Using the Software as a Service (SaaS) platform assures a low to no IT investment, of particular value to small to mid-sized enterprises. Large companies can use the network to facilitate communications and track and trace their logistics. Small companies, in the past, have had extra challenges competing against bigger players due to the technology and compliance reporting requirements that grow each year. And each of the big customers (retailers such as Walmart, Costco, Publix, Whole Foods, and food manufacturers) has its own compliance and methods. A small player cannot hope to manage all that complexity. So they need the network to rationalize the information for them, as well as find a broker and a carrier service that can get their product economically to the buyer. In systems environments where the purchasing systems are separate from logistics, billing, etc., both parties experience painful conflicts and reconciliation activities. “What was ordered? What was shipped? Did I get the right data? Did the customer receive a perfect order—on time and fresh?” These administrative post-sale burdens are costly for both parties, and they damage important relationships. When the data is not there, disagreements arise about service, timeliness, or quality. Having all the information in the network reduces these reconciliation issues. Using a network, therefore, can strengthen collaboration between key partners, saving time and cost. Sounds like a good place to be. I met with hundreds of AFS customers at their user conference this spring. With great food manufacturers and distributors as customers, we had over the top snacks at the break times! But let's move on to more important topics. As discussed, the food industry is highly diverse as foodstuffs move into production—think of all those ingredients that get created: flour, sugar, yeast, cocoa powder. Each producer has to find sources, produce, and then sell their product to the next producer along the chain. Somehow, the idea of raw material sitting in warehouses for long periods of time is unappetizing. So these firms need solutions that allow them to keep the product moving efficiently. Food production is a high volume, generally low margin industry. So keeping equipment moving 24x7 is crucial to profits. Feeding the production with timely supply is critical, so it is essential to have software for procurement and receiving management on the buyer/customer side, and have order management and fulfillment (warehouse management) on the supplier side. AFS has dedicated their firm to making sure that large and small producers can operate at peak performance. The theme of their conference this year was the perfect order. The emphasis at the conference was that in a world of increased competition, manufacturers and distributors cannot afford to ignore operations and information technology concerns. With the proliferation of product competitors, if your firm cannot deliver the perfect order—that is delivering the best product and on time—you might get replaced. Today’s mega producers and grocers look at categories. They need flour for bread. They need bread for the shelf. It will only be your flour, your bread, if you can meet all the criteria as a good trading partner. Product alone won’t do it. Now, onto quality. This is the inherent expectation across any supply chain: that the products we consume, we use, we fly in, that we rely on for our lives be produced with the highest quality. That is what firms like InfinityQS strive to support for their customers. We recently had an update from InfinityQS on their ProFicient™ solution. InfinityQS provides their solution for many industries, from Semiconductors, Aerospace, and Defense to Electronics and, of course, the Food industry. Of late, the increase in regulations and compliance reporting has put pressure on producers and importers to improve process controls, to be able to audit them, and to provide an information trail—traceability—across their supply chains. So their recent announcement to make ProFicient on Demand their new SaaS delivery model will enable synchronization of quality goals and activities across the whole supply chain. Quality systems in the past were enterprise affairs—one installation at a time restricted to high-end manufacturers that had big IT budgets and staff. The growing concern by consumers and governments that everyone in the chain be responsible for quality will put pressure on all custodians of the product to participate in quality processes and reporting. Your brand power depends on quality. 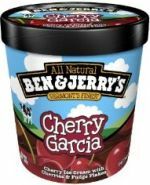 Ben and Jerry’s for example, an InfinityQS food customer, is an example of a company that knows that a premium product needs investment in technology and process in order to maintain that premium position. (Ben and Jerry’s Case Study). Or how about a brand that ensures that every kernel pops—Orville Redenbacher (a ConAgra food company - case study here) keeping quality high, but also ensuring that all government (FDA) regulatory compliance requirements are met. With the Food Safety Modernization Act (a bipartisan legislation) and more focus by international organizations on consumer safety, companies need to take a harder look at their quality processes and systems investments. Going on-demand, ProFicient can ease that investment for their customers by reducing the upfront costs and implementation time. So that next ingredient in the recipe for the supply chain solution is connecting the physical world to the digital world, the systems. Food loss is a big economic problem. Across the supply chain, due to spoilage of various kinds, produce and finished products are thrown. Costs are high. Cold chain distribution is a buzzword that has been around awhile (see Cold Chains are Hot), with slow implementation progress. But Intelleflex is making it happen. We have met with Intelleflex several times and continue to be impressed with the company’s progress and solutions, and the success they are having at cold chain integration. One challenge in the food chain, of course, is the diversity of handlers and custodians along the chain. Who wants to be responsible for maintaining and monitoring the perfect handling? Sensor technology allows for the tracking of conditions such as temperature, vibration, etc. Initial implementation looked at history—what happened at the end of the chain. But avoiding misfortune is the key—again, the earlier you discover a problem the cheaper it is to address it. If you track only history, then decisions about the disposition of the shipment happen too late. If you already shipped a spoiled product, you are throwing good after bad, as the saying goes. If it’s discovered on the customer side, you paid shipping and probably lost a customer, as well, due to poor quality. Intelleflex XC3™ is an RFID tag and sensor powerful enough to read without opening packaging, cartons, or pallets, so along the supply chain each product custodian can monitor the temperature of the produce. This goes a long way in increasing adoption. If I can know at the time that conditions are not right, I can fix that. Having responsibility without control is not a good situation for a carrier. But if they can have the tools to prevent problems, they are more likely to adopt the technology and take responsibility for quality. Peter Mehring, the CEO of Intelleflex, has become very passionate about food supply and the huge amount of waste in the chain. 50% of the waste in the chain is due to temperate variability, a problem that Mehring knows he can help address. The value proposition for even small growers is huge. Reducing or eliminating costly mistakes such as leaving picked produce in the hot sun waiting for late pick-up, and shipment or packing errors (one bad apple, as they say) can decrease spoilage. Read also Reducing Spoilage in the Fresh Food Supply Chain, how Intelleflex and The Hartford recently formed an alliance to use RFID and temperature monitoring technologies to tackle the multi-billion dollar spoilage problem in the world's food supply chains. These solutions providers either have or will be putting in mobile apps. These are particularly useful in the food industry, where so much of the work happens outside the building, in yards, fields, and customers’ offices. Today’s work force needs to stay connected remotely as real-time changes in the business occur. All web, all the time, is another attribute of particular value in the food industry. From the diversity of players to their need for inter-connectedness, relying on on-premise systems with slow inter-enterprise communications won’t cut it. Traceability is growing in practice, although it will be a long journey to a fully transparent food supply chain. But the technology community, with SaaS solutions, has made it easier for end-user adoption. Now it’s up to the users to adopt. And one final food for thought. From a global humanitarian perspective, we could feed the world with high quality food at a lower cost and probably have enough to meet the needs of our exploding populations if we could just reduce the waste in the food supply chain. In Part Two we will explore the Recall process. 1 Cranford is a period piece about the impact of the introduction of modernity and industrialization such as the railroad in the 1840s in rural England. 2 Your feedback to strengthen this map is appreciated.